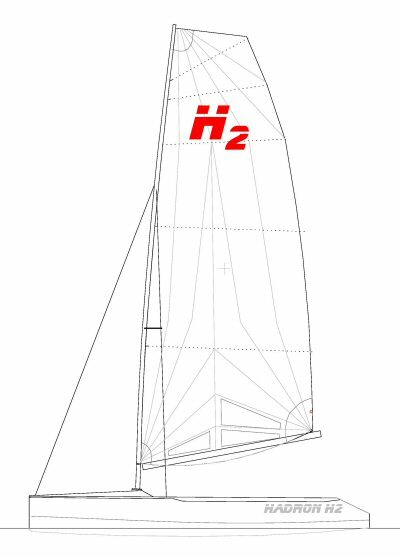 Hadron H2 is a commercial development of the original Hadron singlehander dinghy designed in 2011. The first boat was launched in February 2016 and at September 2018 there are 37 boats built or on order. Yachting journalist David Henshall has carried out a Boat Test of the H2 for Yachts and Yachting. View the article here. The Hadron H2 singlehander dinghy is sold in the UK by Hadron Dinghies Ltd. Their website contains full specifications and prices. The first national championships were hosted by Warsash SC on 2-4 June 2017. Every H2 then built (13) attended. The 2018 championships are at Herne Bay SC, Kent - we anticipate 20 entries. The extremely light, performance-orientated but forgiving hull form and rig produces a versatile, manageable dinghy which can be sailed on lake, river or sea, with good performance to windward and also offwind. 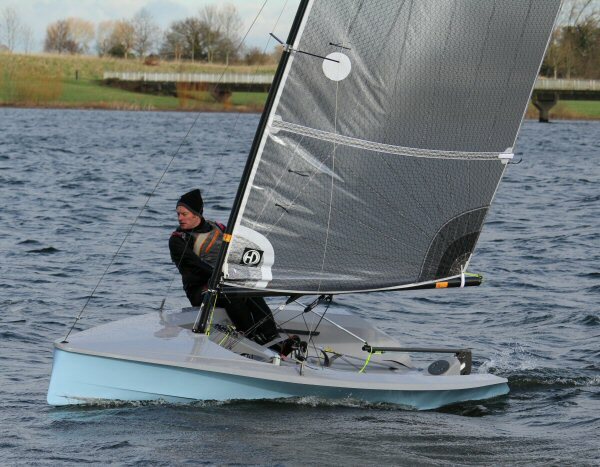 An easy performance dinghy for novices. Excellent handling and exhilarating performance for experienced sailors. A unique, 2 compartment buoyancy configuration which ensures that the boat floats low in the water when on its side, thus facilitating righting. The boat floats on its side with the centreboard just clear of the water, and when righted retains a very modest amount, which can be evacuated via the self- bailers within a minute or so, even in light conditions. The angled boom provides plenty of headroom for ease of tacking. The large, deep cockpit area and ergonomic side decks provide a comfortable sitting out position. The central buoyancy compartment acts as a useful seat in light conditions. There is also a thwart for that purpose. Rig controls are led to cockpit sides for easy adjustment afloat. The flared hull, good freeboard and wide gunwhales minimise spray and keep the crew dry in all but the windiest conditions. One of the biggest difference between the H2 and the original Hadron is the WEIGHT. The latest materials and techniques are used in the hull manufacture. The hull layup consists of carbon cloth with additional carbon/aramid reinforcement in areas liable to hardest use. The result is a hull which is extremely strong and long-lasting and significantly lighter. The CLASS RULES are now available here. © This site is the copyright of Keith Callaghan. This page was last updated on 5 September 2018 .